I don't know whether this clip has appeared elsewhere in a DVD extra or TV special, but as soon as I saw it flashing by, I knew I had to have it. Not much comment is required to introduce these caps. 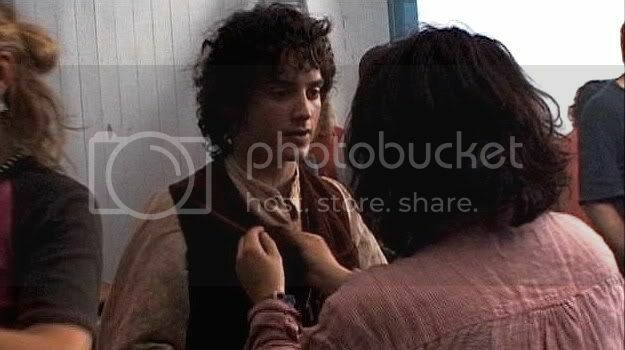 A lot of actors and crew are milling around as the camera moves in on Elijah Wood, who is receiving final adjustments to his costume. "Do I have my bag at this stage...?" he asks the costumer. "Because I don't know if I have it up in Moria." I don't know what the costumer said. Was she capable at that point of discussing the whereabouts of his bag? 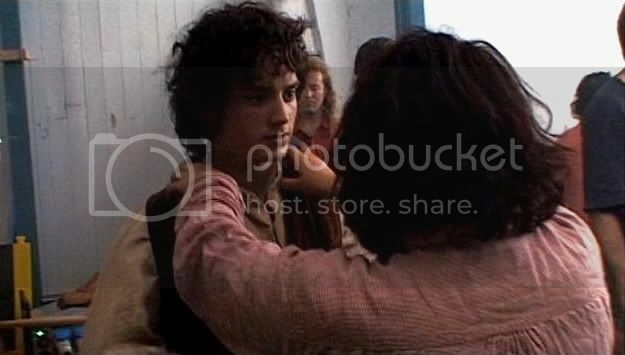 All I know is that I would have liked to have been her at this moment. I scroll through these, transposing my arms and hands for hers, feeling the shirt-linen and velveteen between my fingers, warm with living actor. 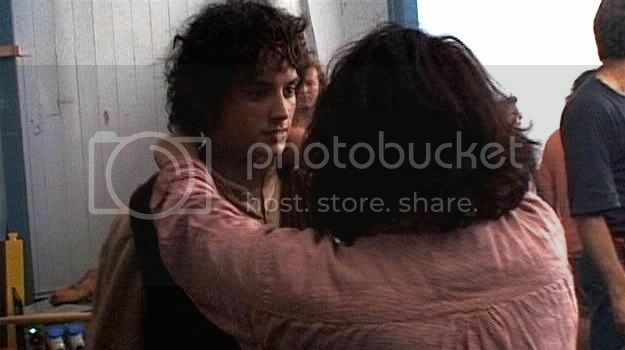 Even if he isn't really the Halfling Prince, I would have loved to have had the opportunity to be this close. As can be seen, the lighting is very dim and the picture grainy, but I loved the frames so much I didn't care. I did what I could to lighten and focus them. ETA: frodoholic has downloaded all these caps and lightened them further. The result is to bleed a lot of the colour out, but also to allow viewers to see far more detail of expression. 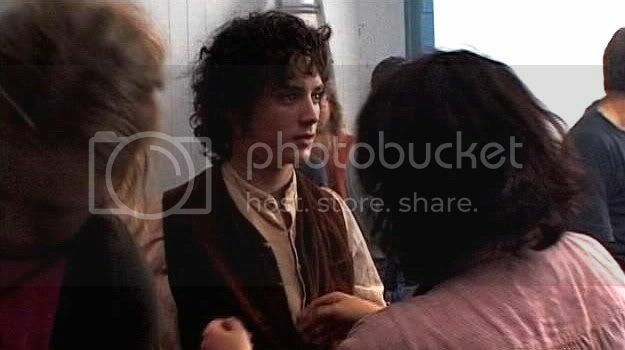 Because I think they are so worth seeing, I asked if I could link them here, and Frodoholic has agreed to unlock her post. Woo hoo! 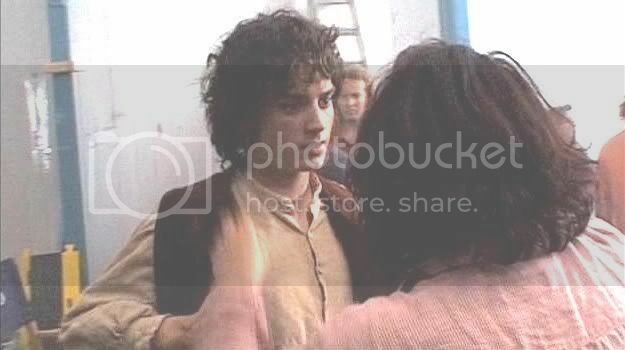 To see the whole set, visit Frodoholic's entry HERE. 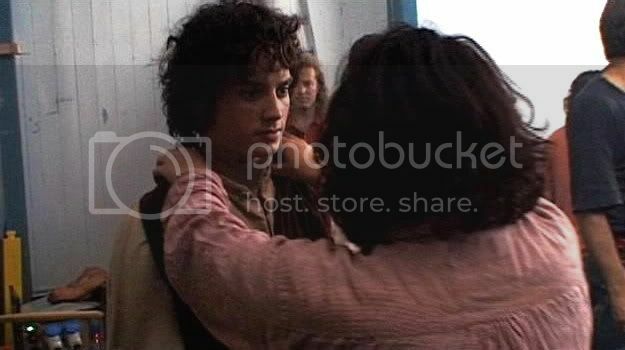 Listing for all Frodo and Elijah screencaps HERE. As always, thank you. I suspect this is as close to the 'extra's' on these DVD's that I'm going to get. You are welcome, Shirebound. I was hoping these sets of caps might be a service to people who have decided not to buy the discs and who, perhaps, are not able to find them to borrow or rent, either. Gasp! 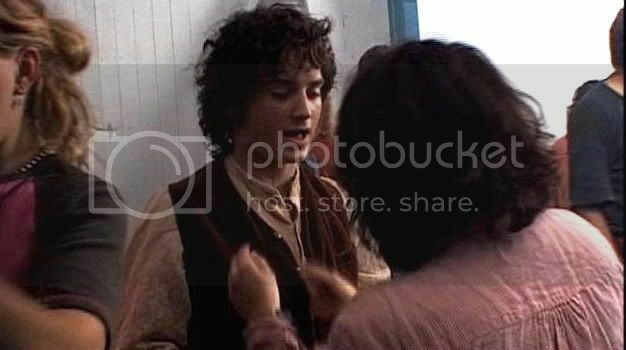 Even better if it IS the halfling prince and those are MY hands! **turns green** Why can't I have job satisfaction like that? Luckiest woman in the world. If I were her, I'd be pretending it was the real Frodo for sure. Ah, I knew you'd appreciate these caps, Pearl. I wonder if the costumer had an special appreciation for him? I suppose it entirely possible that she had only aunt-like affection for him. I would look like I harboured only aunt-like affection for him, but it would, in fact, be more like Uncle Ernie's (of "Tommy" infamy). I know, Mews. I think I'd be fumbling the buttons or sticking him with straight pins during his fittings, poor lad. Or just standing there, staring in a goony, sappy manner, petting his waistcoat fronts over and over until the sound of his voice jogged me out of my trance ("Erm, I have to go on set now, Ms. Mechtild..."). Your favourite part, honeyandvinegar? I am all the more happy I made caps of this scene, then. I do love this sequence to pieces, really. 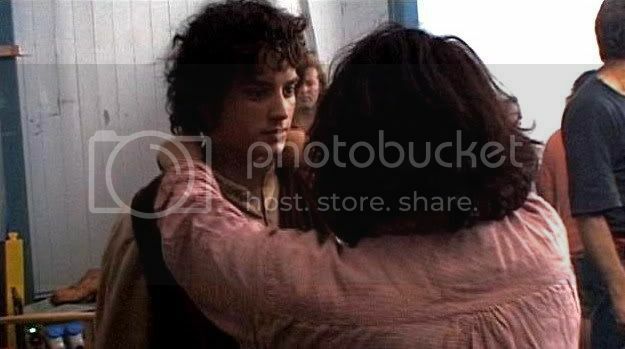 Honestly, I have no idea how anyone working that close to him was able to even *function* without melting into a puddle. 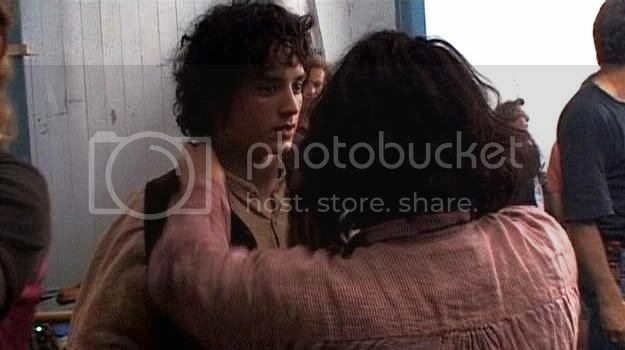 I would'nt even be able to talk if I was that woman. If you want me to lighten them, I will for you. ;-) Thanks again for sharing! Hey! That shows a lot of detail! If you do a whole lighter series you should post them in your LJ, Frodoholic. I've still have loads more (caps) to go here. Oh! These are wonderful! I would've either been fired or commended for my erm ... attention to detail (I'm sure the former and not the latter because I couldn't have kept my hands off) He's just so beautiful. Yeah, I think I'd be looked at askance. How long can a costumer pick lint off a costume that's supposed to look dishevelled? You're welcome, Starlit. 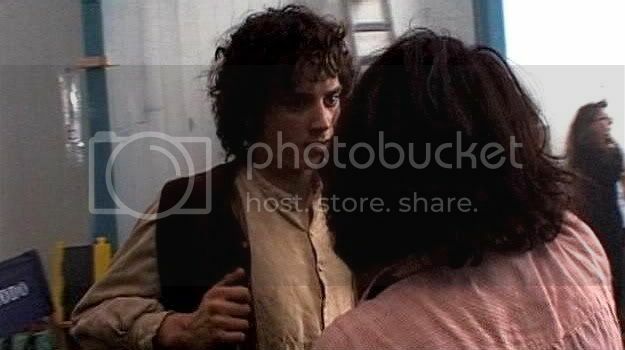 I saw you over at Frodoholic's. 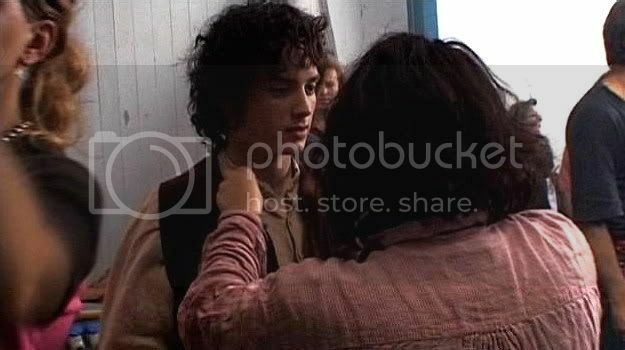 When Frodoholic writes back, I'm going to link her lightened caps. I like the colour in the darker prints, but you really can see him much better in the ones she made. I think it will be cool to offer people the opportunity for people to see both. I am so doing the wrong job. Oh, la la. How true. When she gives me permission, I'm going to link lightened versions of these that frodoholic made. They aren't as pretty because they lose the rich colours, but the detail they reveal of Frolijah makes them well-worth seeing, maybe preferable for swooning purposes. You don't need to wait for my link, though. You can just click on her name and look, Peachy. Awww, I'm at work right now, but all I have to touch is my PC keyboard and mouse. 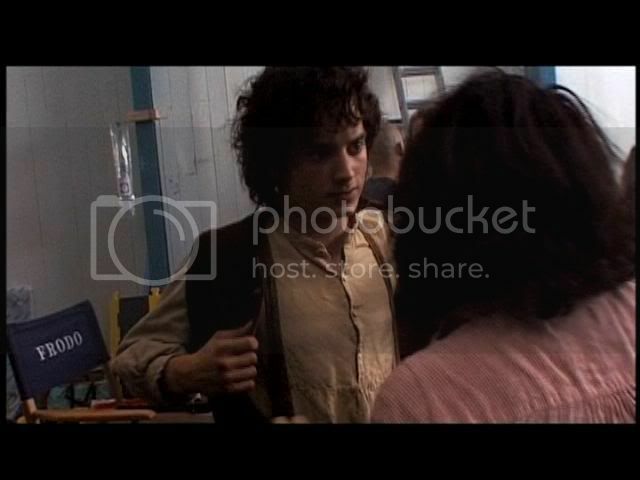 While I'd prefer to use my hands to adjust clothes on that lovely guy! Thanks for sharing, hon, now I know I'll buy the DVD as soon as it will be released here in Italy! 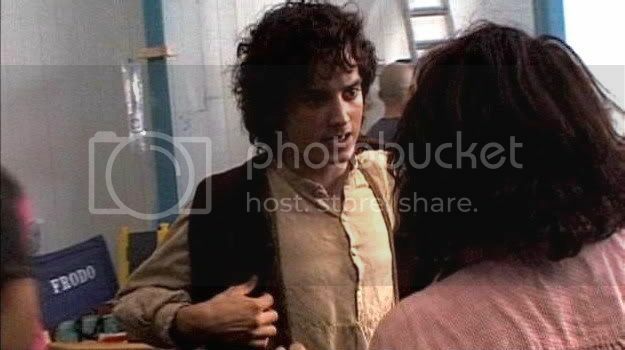 While I'd prefer to use my hands to adjust clothes on that lovely guy! 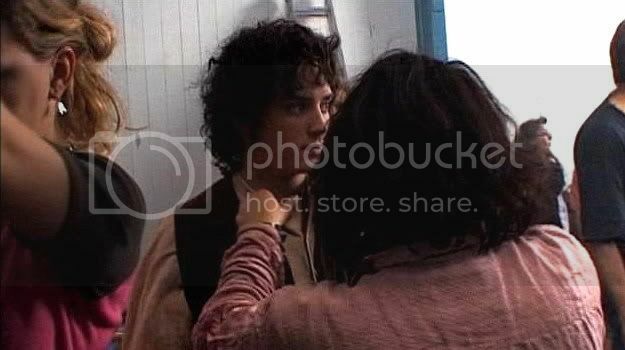 If I were that costume lady I wouldn't be satisfied with that collar without a great deal of further adjustment. Thank you for taking so much trouble to do all this. 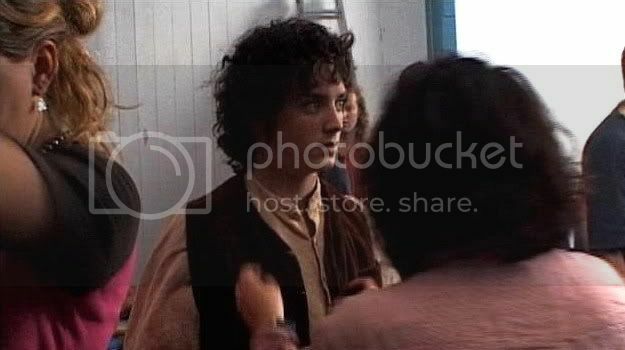 I have just discovered that these caps go way back further than I had realised and that there is lashings of Frodo (and more) to wallow in. Oh, you know me. Can't resist posting images of The Face. Do you mean all the way back? That link at the bottom hooks you up to a table of contents with all the entries listed. Maybe that's what you're talking about? P.S. 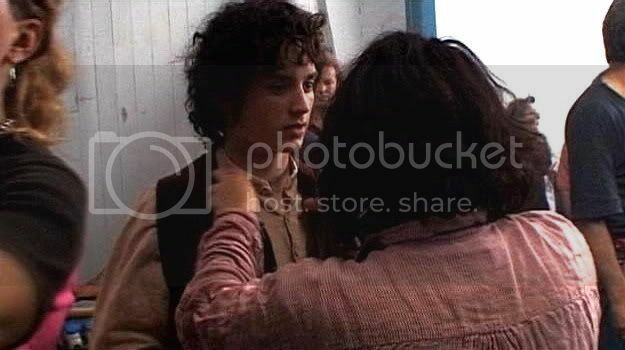 I might have to pick the Moria dirt off his trousers, too. "Oh, look at all this on your bum, Mr. Wood! 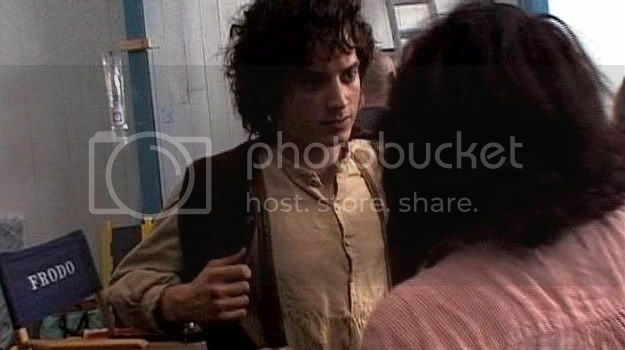 Here, I'll just brush that off gently..."
Maybe it's just me that sees it, but there seems to be just the sweetest little bit of shyness and reservation in his face from the first frame when the dresser begins to straighten his costume. I suppose the appeal of that little bit of vulnerability for me lies in the fact that he doesn't seem to think he's God's gift, but "just plain" Elijah. That is definitely part of his appeal, Honey, EW's humility about the gift of his looks. Perhaps because he's a man, too, he doesn't think of his "gift" as unambivalent. I am sure he appreciates people saying he looks beautiful to them rather than repellent, but he also reads the remarks that call him "small" (what man wants to be called "small" in any of its meanings? ), petite, porcelain-faced, androgynous, even girlish. Those remarks might temper any inclination to feel secure in his good looks. He's not losing his buttons again is he? The Ripper must be back. "All I know is that I would have liked to have been her at this moment." 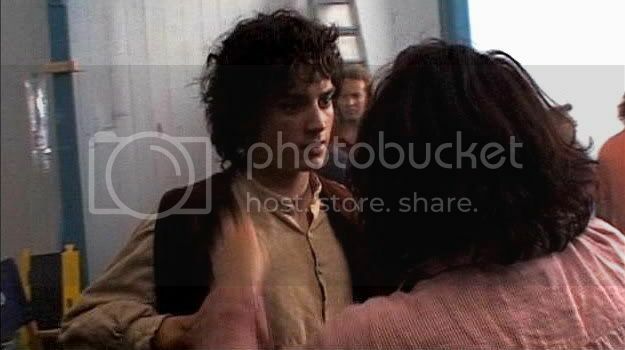 THE Face ... thank you and Frodoholic for this images. I didn't see them before, all I am able to do now is ... STARE! Now I have to go back to work, you put a smile upon my face and all energy is back! THANK YOU for this wooooonderful treasures honey! Take care, keep your spirit, it's wonderful to see you!